What Can You Do to Assure Your Safety? We, science communicators at Miraikan, are providing information concerned with the earthquake, the tsunami, and the Fukushima Daiichi nuclear power plant, which helps you to understand the issues up front. This cross-section view illustrates the mechanism of the unit 1-5 reactors in the Fukushima Daiichi nuclear power plants. There are 6 reactors in the plants. All of them are of the BWR (Boiling Water Reactor) type, which produces steam with heat from fuel rods, turns a turbine, and generates electricity. This graphic illustrates the Mark-I type BWR, which was adopted for unit 1-5 reactors. Please use as a reference for timeline of the Fukushima Daiichi nuclear accidents. Fuel rods: A rod is made of zircaloy cylinder containing 300 pellets of 1 cm diameter and 1 cm height. About 4600 fuel rods are used in one plant. Pressure vessel: The most inner vessel holds the fuel rods. During an operation, steam of about 280 ℃ and 70 atm is generated inside. It is made with steel, 15 cm thick. The design limit of the pressure is 90 atm. When pressure inside gets too high, Safety relief valve opens automatically and the hot and high-pressure steam is injected into the water in the suppression chamber (wetwell) so that the pressure is controlled. Containment vessel: Made of steel 3 cm thick, containing a pressure vessel inside, and preventing radioactive material from leaking out. It consists of two parts, the “Drywell” and the “Wetwell”. Suppression chamber（Wetwell）: A doughnut-shaped chamber forming the lower part of a containment vessel of Mark-Ⅰtype. The upper part of a containment vessel is called the “Drywell” with a flask-shaped chamber. The suppression chamber is filled with water, into which steam is led from the pressure vessel or the drywell when the steam pressure becomes too high. Building shell: The outermost barrier of a reactor. It is made with ferroconcrete, 1 meter thick. 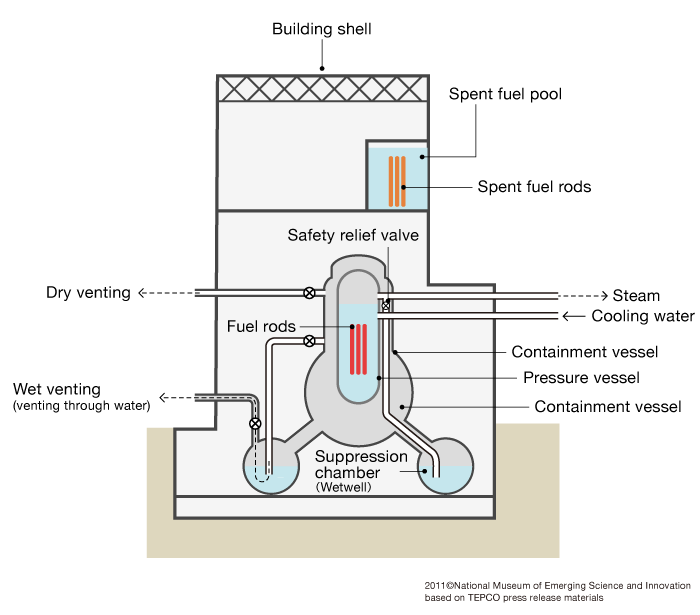 Spent fuel pool: A pool to cool down hot spent fuel rods that continue producing heat. Venting: Releasing gas from a containment vessel to the outside. Venting through water in the suppression chamber (wet venting) is preferable, however, this time direct venting to the outside (dry venting) were also conducted.